Anyone who has paid attention knows that, since 2008, many billions of dollars have moved from active investment strategies to passive investment strategies. Active strategies utilize human managers to scour the landscape and select those investments they believe are best suited to grow in value or withstand economic resistance. Passive strategies are essentially run by a computer and a set of rules. We believe passive strategies can play a productive role in portfolio construction, but it is important that we recognize they aren’t really passive in the way they have been sold. A do-it-yourself investor selects several passive strategies and creates a portfolio they feel will do acceptably well. A financial advisor selects a portfolio of passive strategies that she feels will best help her clients reach their financial goals with a minimum amount of risk. A consultant helps their institutional client select a portfolio of passive strategies they feel will best meet the long term liabilities of the organization. A hedge fund trades in and out of specific passive strategies to take advantage of mispricings in the market, at least according to them. Every one of these approaches required active decisions about which asset class to target, which instrument to use in order to gain the right exposure, and how much to put in each asset class. There is nothing passive about it. 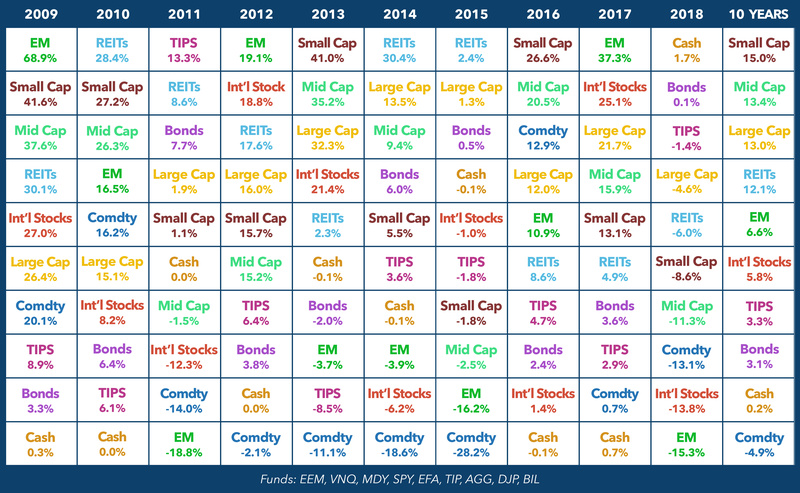 A great deal of research shows that the asset allocation decision has the greatest impact on investment returns and how likely you are to reach your investment goals. The image below is an asset class performance matrix. It reflects how any number of annual asset class returns rank from period to period. You can quickly see that no asset class stays on top or on bottom forever. While not forecast worthy, some behavior is notable. In the last ten years, international has been neither the best nor the worst. The weakest performers in 2015 became the strongest in 2016. And in 2018, even cash had its day in the sun. So you, or your advisor, must make a decision about how you want to allocate your assets. There is no right or wrong way to do this, but it requires an active decision, the best of which are both well considered and intentional. Passive strategies have been around since Vanguard introduced the first index mutual fund in 1976. But the popularity of passive investing over the last decade has grown in parallel to that of exchange traded funds (ETF), so they are often referred to synonymously. According to the Investment Company Institute, as of January 2019, the ETF market in the U.S. offered 2,007 funds. As you ponder how to execute your allocation orders, you will need to cull through a lot of chaff to get the wheat. For each class to which you wish to add exposure, you must decide which characteristics you seek. If you want large cap equity exposure, do you select a fund that mimics the S&P 500? Or one that is built to replicate the Dow Jones Industrial Average? Benchmarks such as these are just rules-based portfolios. Meet the rule and the security is in. Some of the benchmarks are better known than others, but that doesn’t mean they are a better choice. There can only exist so many S&P 500 ETF’s. In order to be competitive and stand out, many ETF sponsors now offer funds that are built using their own rules, or factors. A factor may be driven by sales, earnings, leverage, company size, valuation, momentum, or almost anything you think will attract assets. Or you can decide to buy an ETF that focuses on specific industry sectors such as telecom, or financials, or technology. Does anything about this sound passive? Not a chance. Now that you have selected your asset classes and have identified the funds you will use, how much should you put in each? The simplest method is to put an equal amount into each, but it is also the least thoughtful. Ideally you would consider the risks of each in conjunction with your investment goals and allocate accordingly. Even if you land somewhere in between the two extremes, active decision-making is required to put your investment plan in place. At its most accurate, passive investing refers only to security selection. Passive investing buys the ‘market’, however that might be defined for your purposes. You hand over the security selection process to a set of rules that are managed by computer. You get the bad with the good and all that entails. Mitchell Capital is an active manager who helps our clients invest with intention, from asset allocation all the way down to security selection.